You are here: Home / Double Or Triple Glazing? For the last 30 years Sapphire Windows have been installing high quality double glazing in homes throughout Wales. Our double gazed windows are A rated as standard. 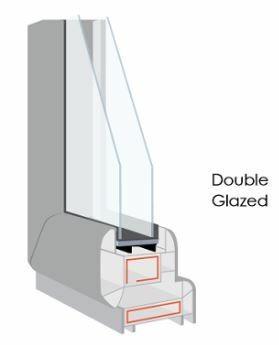 The building regulations state that replacement glazing must have a minimum window energy rating of band C. By incorporating the best performing double glazing into our windows, we ensure that we supply the very best in terms of energy efficiency and thermal performance, exceeding the minimum standards imposed. By doing so this will help keep your home well insulated and your energy bills kept low. The extra glass panel reflects more heat back into your home, making it warmer and helping to cut your heating bills even further. Triple Glazing is an excellent choice for cutting out external noise, too, ensuring you feel a big difference in any room. Our triple glazing features two panes of low-emissivity (Low E) Glass and one pane of Low-Iron glass. Low E is an invisible coating that allows heat past the window from the outside and reflects back into the home from the inside. This saves a great deal of energy and money off your heating bills. 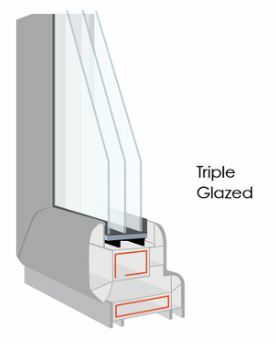 Our triple glazed sealed units are filled with two chambers of argon gas. Aragon gas is heavier than air, and acts as an insulator, this helps block out noise as well as cold air. The panes of glass are separated by warm edge technology spacer bars. These act as yet another barrier to heat loss. There are a huge range of decorative glass options available. 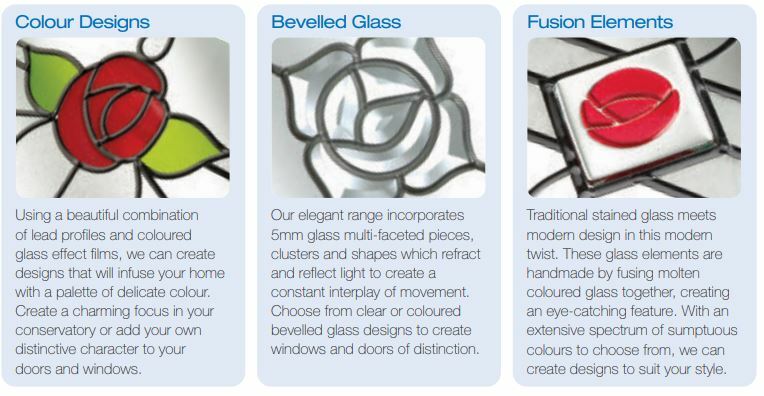 We would recommend downloading a decorative glass brochure using the ‘view our brochures’ icon on this page. There is also an option to design bespoke decorative glass. Therefore if possible, we can customise one of our designs or we can design and create decorative glass based on your vision.